It’s hard to say where the storytelling urge comes from, and why some of us are driven to do it. I have always loved writing and drawing, and there is something fascinating about the process of making characters and their stories come alive on the page. You get to create a little world and then play in it! Young people are a great audience. Curious, critical, imaginative and full of questions. I think that really good children’s literature speaks to adults as well, so I write the kinds of things I would like to read too. As a kid I loved Dr Seuss – and I still do. I was especially attached to a small paperback copy of The Sneetches and What Was I Scared Of?, which eventually fell to bits from so many re-reads. Dr Seuss definitely influenced my own style: rhythm, rhyme and oddball creatures are a few of my favourite things. And he delivered great messages in a non-preachy way. An octopus. Stretchy, strange and curious. I visited Shakespeare’s grave in Stratford-upon-Avon last year. It was very moving for me to see it (though visitors are not allowed to touch it). My husband took a photo of me kneeling in awe of the great man… and then our camera was stolen! Tragedy! Practise. Persist. And take some life drawing classes. Playfulness, and the porous border between the imaginary and the real. Also: goggly eyes. I have two young daughters, so most of my non-writing time is wrapped up with them. At the moment, this involves a lot of sport! Whenever I can grab a few spare moments, I like to make crochet sculptures. Right now I’m working on a series of colourful life-sized squids, octopuses and cuttlefish. And, of course, I love to read. My brain is constantly on the lookout for things that might spark a good story. Sometimes a phrase pops into my head, and the story grows from there. Other times it’s a character that emerges when I doodle in my sketchbook. I am often inspired by things that kids say or do, and by the way they interpret the world. When you find the perfect knock-out line to end it off. Bam! Done! Want to see Nicki at the festival? Buy tickets for her story writing workshop, Old Stories, New Eyes here. 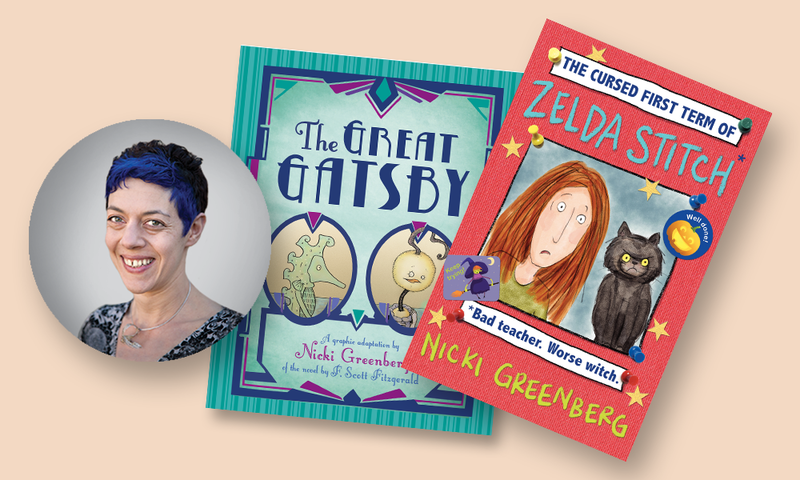 You can also catch Nicki at our special evening events, For The Grown-Ups, and Talking Books for Young Adults, where she'll be facilitating Through a Visual Lens (Thursday 10 May) and Let's Get Graphic (Friday 11 May).